Aubrey, Les, Sr., Les, Jr.
Granddaughter and daughter of the two Les Harrises, respectively. Les Harris, Sr. on drums. He was a kid growing up in Newburyport, Massachusetts, a kid who’d taken a liking to the drums and was learning and practicing the rudiments, anxiously anticipating the time when he would own a real drum set. When, finally, that time came, it came in installments, one part of the kit at a time. As it happened, the first piece of drum equipment he acquired was the hi-hat. You, of course, know what a hi-hat is, but for those who don’t: It’s the foot-operated stand with a pair of cymbals mounted on the top. Right-handed drummers operate the hi-hat with the left foot, since the right foot is occupied with the bass drum pedal. But the young Les, even though he was right-handed, didn’t think of that, and he just did what seemed natural, operating the hi-hat with his right foot. As his drum set expanded, and his bass drum came along, it was also only natural to operate the bass drum pedal with his left foot. Les Harris might have turned out to be the only right-handed drummer to operate his hi-hat with the right foot and his bass drum pedal with the left one. In fact he was for a while. 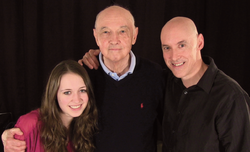 But when Les Harris, Jr. came along, with Les Harris becoming Les Harris, Sr., and when Les, Jr. was old enough, Les, Sr. started giving him drum lessons. His way. To say that Les Harris, Jr. followed in his father’s footsteps is, well, as you can see, literally true. But he did so in the broader sense as well. Father and son both grew up in Newburyport. Both studied at Berklee College of Music in Boston. Both became music educators. Either of them could have gone off to New York or Los Angeles and enjoyed great national fame, but, as we’ve seen, they prefer to do things their way, and both stayed close to home—Les, Sr. in his hometown of Newburyport, Les, Jr. in Exeter, New Hampshire. Oh, and both raised a child who is musically inclined. Which brings us to the third generation of this remarkable jazz family, namely Aubrey Harris, granddaughter and daughter of the two Les Harrises respectively. It will surprise no one to learn that Aubrey was attracted to music early on, that, in fact, she took her first piano lessons at the age of just four. At nine, she added clarinet and began guitar lessons. At the age of 12, though, she’d settled on what would be her instrument. Drums? Well, no. Preferring, in the family custom, to do things her own way, she chose the bass. And once again following in the footsteps that preceded her, she’s now a student at Berklee, as well as the recipient of a full four-year scholarship. Plans for the future: to play and to become a music educator. Of course. Getting back to Les, Sr. After graduating from Newburyport High School in 1950, Les joined the Navy. His reasoning: He wanted to attend the Navy School of Music. And when he left the Navy, feeling there was still more to be learned about music, he headed off to Berklee in Boston. Somewhere along the line, he also found time to study with George Lawrence Stone, one of the most influential drummers and teachers in the history of music education. 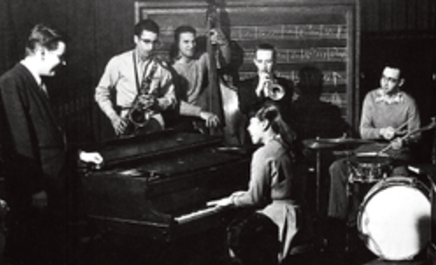 A talented student, Les was part of the house quartet at Boston’s premier jazz club of that era, Storyville, along with the legendary pianist Toshiko Akiyoshi, alto saxophonist Boots Mussulli, and bassist Gene Cherico. During those years and beyond, Les was also gigging closer to home, often with jazz luminaries like trumpeter Herb Pomeroy. Les reminisces about those days, recalling a place they called the Dugout (also known as the “Bucket of Blood”), in the Edwards Hotel on Salisbury Beach, where quart-sized beer bottles flew routinely across the room. Ultimately Les returned to Berklee as a professor of music, and he taught there for 30 years. Not just there, though: He also found time to teach music theory at no charge to Boston’s inner-city youth, in appreciation of which Berklee presented him with an award for his selflessness. Of course, Les continued gigging, and did a lot of it here on the Seacoast at such venues as The Depot in Exeter, the Horse of a Different Color in Portsmouth, and ultimately The Press Room in Portsmouth, where the beloved pianist Tommy Gallant led the Sunday night jazz trio that included Les, Sr. and bassist Jim Howe. In 1986, Les, Sr. was found to have a spot on his lung, and it was indeed a sign of cancer. He was operated on at the time and survived it—but it was a shot across the bow for him, prompting him to start winding down his busy gigging schedule. And that’s when Les, Sr. turned over his place in the Tommy Gallant Trio to the obvious candidate, Les, Jr.
As a member of that illustrious trio and its successors since then, Les, Jr. has had the opportunity to play with some of the best known artists in jazz, including Clark Terry, Milt Jackson, Phil Woods, Art Farmer, Annie Ross, Teddy Wilson, Hank Jones, Milt Hinton, Ray Brown, Marian McPartland, Jimmy Heath, Ken Peplowski, Al Grey, Marshall Royal, Buddy DeFranco, Bud Shank, Harry Allen, James Moody, Rufus Reid, Benny Green, Charlie Mariano, Mark Murphy, Sheila Jordan and Geoff Keezer. A stunning lineup of jazz musicians by any estimation. Meanwhile, young Aubrey, now in her first year at Berklee, continues to manage a busy performing schedule. In 2010, she appeared as the bass player in the movie “40 West,” featuring Jennifer Porter and Wayne Newton. In 2011, her transcription of Tal Wilkenfield’s bass solo on “’Cause We’ve Ended as Lovers” was voted Video of the Year on the bass website NoTreble.com. In August of 2012, Aubrey was selected by the Grammy Foundation as one of a group of high school students nationwide to participate in one of three “Grammy Camp” sessions. In December of 2012, she was one of seven Grammy Camp alumni chosen to perform at the American Country Awards in Las Vegas with country singer and guitarist, Keith Urban, a nationally televised event. Les, Sr., now retired from the classroom, continues to teach locally part-time and has been honored by the Newburyport Education Foundation for his artistic contribution to the community. Les, Jr., while living in Exeter, performs regularly with many of New England’s jazz artists and many others beyond the region. He’s a regular member of the Paul Broadnax Quintet and of the New Guitar Summit with Gerry Beaudoin, Duke Robillard and Jay Geils. And, of course, he continues to play frequently on Sunday nights at The Press Room. 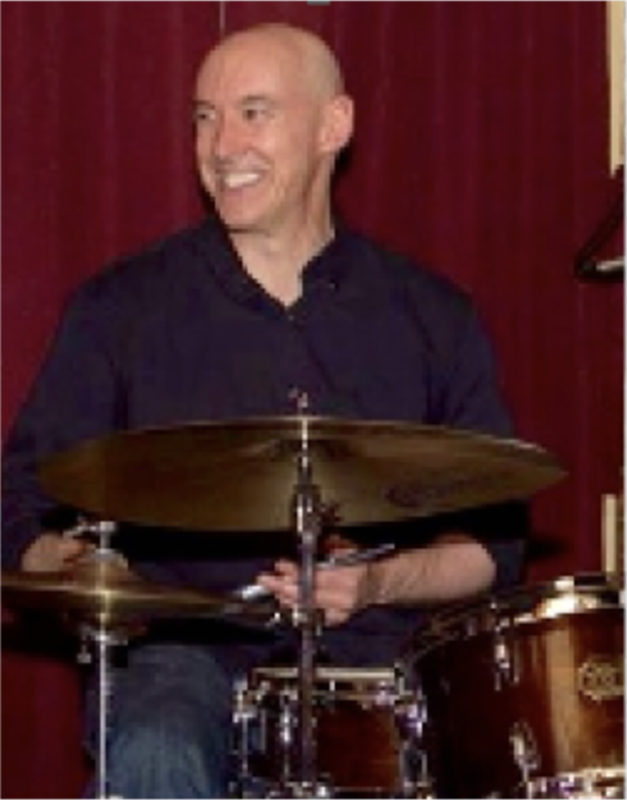 He is also a music faculty member at the University of New Hampshire, the University of Southern Maine, and Phillips Exeter Academy, teaching drums and ensembles. Aubrey is, of course, a work in progress. But, based on the footsteps in which she’s following, Seacoast music fans can expect great things. And whatever she does, she’ll have her own way of doing it. Not long ago, the Harrises were videotaped for ImprovLive365, and what was produced is now available on YouTube. Enjoy these clips! Do What You Love, Y’Know?